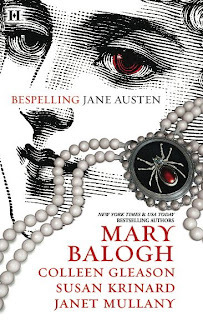 Thanks to Netgalley I had the chance to review Bespelling Jane Austen , an anthology from Harlequin Books. Once I saw that Colleen Gleason had a part in this book, I had to read it. Almost Persuaded by Mary Balough. Jane Everett learns that she has lost the same man over many lifetimes. When Captain Mitford arrives, she has the chance to finally make it right but will she chose true love over the family's view of propriety. I admit that I liked this story the least. It was rather dry and I didn't feel much for the characters. I couldn't buy that they were lovers reincarnated over centuries. They accepted the idea way too easily for me. Everything was just "familiar." He was familiar. She was familiar. Everything was familiar. Northanger Castle by Colleen Gleason. Caroline Merrill is too fond of books and it has turned her brain. She lives in a world of her own imagination, one where there are villains around every corner. She even carries a stake in her purse just in case. When she takes a trip to Bath with her aunt, she is itching for adventure and excitement. The Thortons, a brother and sister duo, seem promising even though Miss Thorton is rather shallow. When she meets her own "Lord Ruthvens" and suspects he's a possible vampire, she has no idea the danger she is really in. This story was so much fun! Colleen Gleason resurrects her Venators for another vampire hunt in the city of Bath. Caroline is a spunky heroine. The sparks fly between her and the mysterious man she keeps bumping into. The dialogue between them is nearly as witty as anything Austen wrote. Blood and Prejudice by Susan Krinard. The Bennets live in present day Connecticut, the founders of Bennet Laboratories. The company is in financial trouble and about to be bought out by millionaire Mr Bingley. Mr Bingley brings his advisor, Mr Darcy. Lizzy senses that Darcy is maybe a little dangerous, not suspecting that he is actually a vampire. While I enjoyed the modern take on Pride and Prejudice, I thought it was a little long for the anthology. The author tries to wind as much of the original story into this version as she could. I did like the inclusion of Lady Catherine and Mr Collins. Their roles in this story suit them well. Little to Hex Her by Janet Mullany. Emma Woodhouse is a matchmaker for supernaturals in present day Washington DC. She is having difficulty keeping her clients happy especially the elf Elton who was turned into a frog by an angry Harriet. Plus her own love life is a mess. Does she rekindle her romance with her college boyfriend and landlord, Knightley, or take a chance on the dangerous vampire Frank Churchill? I liked this story the best, even though it was a bit silly. There were lots of laugh out loud moments. It was also the raunchiest of the four. Emma is a thoroughly modern witch and has no trouble taking a man to bed. Bespelling Jane Austen is a perfect Halloween treat for those who like their supernatural on the lighter side. If only I weren't feeling so over mashups right now, this does sound like it would be a fabulous halloween treat! The whole mash-ups thing never appealed to me but I might enjoy this since it's short stories. I think I'm tired of the whole Austen but not Austen fad. I wasn't all that interested in this one, but now that I know that it is connected to the Venator books I might give it a go. Since I haven't read a mash-up other than this one, I haven't got burned out on it yet. I was a bit weary of another paranormal Jane Austen mashup, but it sounds like fun! Sounds fun! I saw this one too at NetGalley, but thought I would not like it. Now I think otherwise. Great review. Oh, a short story by Colleen Gleason. I must get this!